You can sign up on the facebook event page here to join the feeder March from Halifax-Huddersfield-Dewsbury-Wakefield. Or if you don’t do facebook, you can email the organiser. 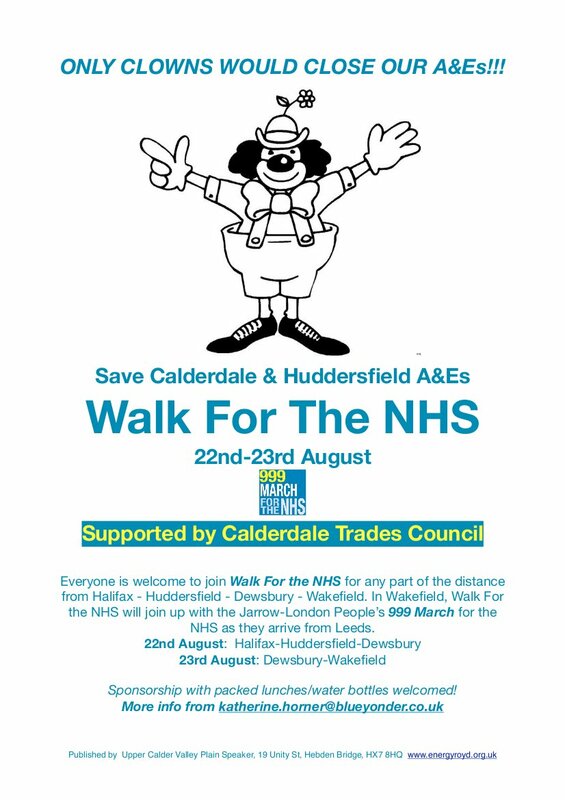 This entry was posted in 999 Emergency-Save Our NHS and tagged Call 999 for the NHS Jarrow to London March, Walk for the NHS feeder march Halifax-Wakefield by jenny. Bookmark the permalink. Yes I agree only clowns would close our A&E’s, or those who believe our IQ is none existent. Just been reading in our local paper about a practices patients who is having difficulties with appointments, four doctors announcing their retirement, two on maternity leave and cannot get replacements, no-one wants the be practitioner, this is music to the Governments ears. There sole intention is to remove the old guard in the Doctor profession,many doctors walking early at a great cost of expertise to the NHS and patients alike, result paying more for in -experience and part time practitioners. Most Doctor practices went along with it not daring to stick their heads above the parapet, forced kicking and screaming into the abyss, only faced with one option- to retire.